Doing anything Saturday? Here’s a few reasons that might encourage you to join the housing protest march in Dublin City Centre. You would think there wasn’t a housing crisis or a housing emergency if you you listened to the Taoiseach Leo Varadkar’s keynote speech to Fine Gael’s Ard Fheis last weekend. He spent most of the speech talking about his desire to reduce taxes and remove billions from state coffers, as a result. It is utter madness – to be reducing, via tax cuts, the public finances that are needed for investing in building affordable housing, providing proper public health, affordable quality childcare, public transport etc. The Taoiseach then stated that “fairness drives our approach to the country’s finances” and that “biggest social housing programme in decades is now underway” and that “Fine Gael is the party of home ownership”. I’m not sure who he is talking about being fair to. 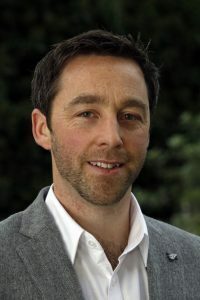 His party’s policies in government have been fairest and most beneficial to property investors, vulture funds and landlords and have been deeply unfair to those renting in the private rental sector, aspirant home owners, the homeless, those in mortgage arrears and those on social housing waiting lists. Rents have been allowed to rise to horrendously unaffordable levels and global investors encouraged to come in via low tax schemes and buy up new rental housing and raise market rents. And in terms of Fine Gael being the party of home ownership – that is utterly delusional. They are the party of property ownership –for the few – for high income households who can afford to buy and investors and landlords. But for most people looking to buy a home this government has done very little – they have not built one affordable house in their eight years of government. But in that statement of the Taoiseach – “Fine Gael is the party of home ownership”, at least he is honest about their anti-social housing ideological bias. This helps explains their utter failure to build social housing on any scale over their decade in power. We need a political party in government that is a party that prioritises and stands for ‘the right to a home for all’ – that aspires and acts to ensure everyone has an affordable secure home – be that rented or owned. In regard to his claim of the government undertaking a “major social house building programme” that is more spin and mis-truths. In their main housing plan, Rebuilding Ireland, 85% of the total new social housing is to be provided from the private rental sector through the Housing Assistance Payment (HAP, which is an insecure form of housing as tenants can be evicted by landlords, and it is much more expensive for the state than building directly) and Part V (bought off private developers) or leased (long term rented) off the private market. Just 15% is new build social housing by local authorities and housing associations. We can see this continues this year. 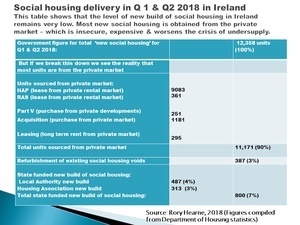 The figures in the table below that I have put together and analysed from the Department of Housing for the first 6 months of this year show that just 7% (800) of the total new social housing units (12,358) provided are actually new build (just 487 built by local authorities). A staggering 90% of all new social housing came from the private market with 76% (9,444) of all new social housing coming from the private rented sector via HAP or RAS. This approach is more expensive and adds to the problem of a lack of affordable supply and fails to do the key thing that government can do to address the housing crisis – build new public housing on a major level. Their Rebuilding Ireland policy approach involves the outsourcing and privatisation of social housing and is a key reason we are in this crisis. Rather than the State guaranteeing the supply of new social and affordable housing by funding sufficiently and overseeing the building of housing via local authorities, co-operatives and housing associations, it is turning to the private market. This is despite the private market’s repeated failure to deliver social and affordable housing, as well its failure to provide value for money. Varadkar is right though when he said that “the housing crisis was many years and perhaps decades in the making”. It is decades of neoliberal pro-market and speculative investor policies that have lead us into this crisis. But he and the government are claiming that their policies and plans (which continue the failed neoliberal and pro-speculative market approach) will work – they just need more time. “it was never going to be easy to turn things around but bit by bit, just as we did when it came to unemployment and the economy, we will”. But the problem is the longer we leave Leo and his government to implement the Rebuilding Ireland policy (which has a failed private market oriented approach as I outlined above) then this housing crisis will continue to worsen. Giving this government more time to continue implementing its housing policy will mean rents rising to even further unaffordable levels, more homelessness, and more and more people pushed into generation rent. We have to see that our housing system has fundamentally changed. We now have a fifth of households in the private rental sector. We have a generation who are going to be in the insecure and unaffordable private rented sector. What we need to do is to change utterly how we see social housing. We need to re-imagine social housing and to change it to this idea of public affordable housing that is available, as in Denmark and Austria, to anybody on any income. We need to see that it is not about tinkering around the edges. We need in Ireland to move to providing a third of housing coming from the non-market, not-for-profit sector to some form of social or public affordable housing, housing associations or co-operatives. Currently it is only 10%. The reality is that the private sector will not build affordable housing. That is the problem we have had over the past 30 years. However, government have shown they are ideologically captured by their belief in the private market approach to housing. And this is the principal reason why we need a major protest movement. The government have shown they are not willing to change policy to what is needed and they are ignoring the many alternatives we have outlined (from the public affordable housing model I have outlined to the Cooperative Housing like O Cualann, or the Fair Rent cost rental model outlined by Housing Action Now, NERI, NESC, the ICTU housing charter, and many others). There is a need, therefore, for the Irish people to stand up and pressure the government to change policy. The new housing movement has grown substantially in the last two years – from occupations such as Apollo House, the My Name Is protests, to the national Homeless and Housing Coalition march last April to Take Back the City and the large Raise the Roof demonstration in October. Combined with the homeless NGOs, charities and many grassroots groups who continue to provide vital support to those affected by the crisis on the streets and in communities, there is a substantial civil society pressure for change. And the range of groups supporting the housing protests is widening all the time. For example, Saturday’s protest is organised by the National Homeless and Housing Coalition and is supported by many large trade unions, NGOs like Threshold, Focus Ireland, Inner City Helping Homeless and Simon, the children’s charity Barnardos, the Left opposition parties, academics, and the Union of Students in Ireland, the Dublin Tenants Association, Irish Traveller Movement and many more. 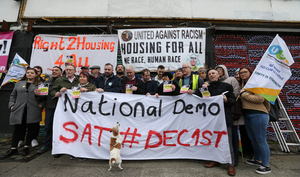 This is one of the main strengths of this movement – the way in which so many diverse organisations and civil society groups and activists are working together – putting aside differences – for the broader goal of creating a massive housing movement that can achieve the right to a home for all. There is a real opportunity in the coming years, if we learn from this crisis, to achieve a right to housing for all in Ireland. There is a real opportunity to ensure everyone has access to affordable and secure housing in well planned and designed communities. The majority of people see the housing system is failing them, their children, their neighbours, the 3800 children homeless and their families, and the country at large. And they are asking what is the solution? Is the crisis solvable? And it is answering these questions and convincing the majority that is the key challenge for those of us who advocate a shift to a housing system to one that guarantees and ensures the right to housing for all. We have to convince and mobilise the public behind the policies that can achieve this. That is our challenge. To succeed we need to make housing the major issue in next year’s local elections and the next general election – and highlight the governments abject failures in policy, unwillingness to change and the alternative policies that need to be implemented. To succeed we need to build a mass social movement – to educate and organise people throughout society – to engender a cross society sense of solidarity – that this affects us all and together we can change it. We need to educate people about the alternatives and show that the crisis is solvable. If we mobilise in major numbers like the water movement, Repeal, and the historic Civil Rights Movement, we can have a real impact. The truth is that when people stand up together and campaign and protest they do have a power to force governments to change direction. Protest can change policy. In fact a cross society movement standing up is our main hope in solving this crisis. That is why it is so important that you get out and join the protests on Saturday – the bigger this movement becomes the more pressure the government will feel and the sooner we can force them to change the failing approach. But we also have to go beyond protest – and create a movement that reaches into every sinew of society. We need to start the conversations amongst each other about how the housing crisis affects us in so many different ways – to break the stigma and silencing – just like Repeal. And show that the crisis is not our individual faults but results from a deeply flawed approach to housing that treats it as an investment commodity and wealth accumulating asset and not as a human right, guaranteeing a home for all. We also need to support the alternative proposals for building affordable housing – work with local authorities, co-operatives and housing associations to organise the building of affordable housing and communities. Why not set up housing cooperatives amongst trade unions, NGOs, and activists as well? 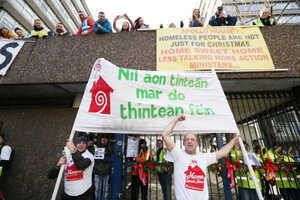 This housing movement can grow to become the biggest and most impactful social movement in modern Irish history. It will need to be to achieve an affordable secure home for all. 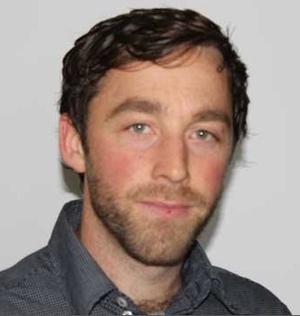 Posted in Misc and tagged Dr Rory Hearne, Housing crisis at 10:15 am on November 28, 2018 by Rory Hearne. I don’t buy the claims that HAP is objectively more expensive than new build. Yes, the state pays the rent, but bears very little of the risk and isn’t left with a structure that has to be totally refurbished in 40 years’ time. It’s also much more flexible as it can house people where they need to live, not where social houses were built 50 years ago. It’s just the state procuring a service from the private sector like any other. Particularly as almost 50% of expenditure on HAP goes straight back into the govt coffers as tax. I don’t think it’s an ideal system; I think that it’s very unfair that someone who doesn’t work for a living could outbid a working person for a rental property, as is the case currently. In any time and place you will have 15 % of the population who struggle to provide shelter for themselves. Many of these people have children. The question is what society should do about it. Once you decide to house the needy you will find that there is no housing policy that does not involve some aspect displacement – a house is a rival good. Have a listen to yesterday’s LiveLine on what is happening to Landlords regarding HAP. having listened I don’t know why the council payment wasn’t taken at source from the HAP recipients social welfare payment. that’s usually how it works. unless the hap recipient isn’t collect ting Dole which doubt is the case. What we really need is to broaden the tax band. It’s insane you don’t pay any tax on the first €18000, in Sweden you pay 33% on every penny you earn after €800. Everyone has to pay something, even if it’s a small percentage, we can’t keep relaying on the working middle class to support the lower paid working class. This is not quite the full picture. The low-paid indeed pay low income taxes. They pay a lot of tax on consumption though. VAT is nearly the highest in the EU. Tobacco, alcohol and motoring – taken together – are also very expensive. Low-income people also tend to buy things that are more tax rich than high-income people do. There are all things that are taxes highly to discourage people from doing them. There are also, for the most part, voluntary. – really? I would have thought that they spent a much larger proportion of their income on things that are zero-rated (food). It is indirect taxation as a share of total expenditure, by income decile. The lowest-income households pay slightly more tax per unit of consumption than high-income households do. Much of this is due to the fact that, on average, low-income people of working age tend to drink, smoke, and gamble more than high-income people do. The paternalistic (though uncharitable) part of me makes me think that (i) the taxes on these vices need to be higher to discourage their use, and (ii) that this makes a compelling case for cutting social expenditure, rather than increasing it. Tobacco and alcohol are addictive. Price has a limited impact on people who are already addicts. It is probably somewhat effective at getting people not to drink or smoke in the first place. Really high taxes on cigarettes, as well as new restrictions on where people can smoke (ban on pubs, etc.) has seen significant drops in smoking rates. It’s a blunt policy tool, but effective nonetheless. Fact Checker, is that the report that has the lowest three deciles having a higher Average Expenditure than Average Gross Income? And then they calculate how much indirect tax was paid on the higher figure – but calculate the percentage from the lower one? 1. Poorer people drink cheaply. The rich spend more. A €5 bottle of plonk from the offie and a €100 bottle of wine in a restaurant have the same excise duty (€3.19). But as a percentage it is much larger on the plonk (82% is duty + VAT). The €100 is less than 11% duty + VAT. 2. Poor people spend all their money in Ireland, and don’t invest. The rich go abroad and spend there, they invest their money where there are no taxes (or reduced taxes). Yes. That aspect of the paper is methodologically problematic which is why I very carefully didnt reference it. If you look at the table I DID reference you’ll find that the tax share of consumption is proportionately higher for low-income people. @Fact Checker – I’m sorry, when I searched for table A1tB it brought me to Table 5 (which has a reference to it A14B) which is the badly presented table – my bad. There is a housing crisis, and it’s bad, but I don’t feel that more informed about the crisis or, more importantly, what we should do to fix things. “We now have a fifth of households in the private rental sector” – that doesn’t sound like unusually high to me – is it much higher than the EU-average? I think that the government(s) should be spending money on programmes (education & training, etc) that ensure that as many people as possible don’t end up reliant on the state to pay for their housing needs, rather than viewing an expanded dependency culture as something to aim for. also why is this March not happening in cork and Galway? 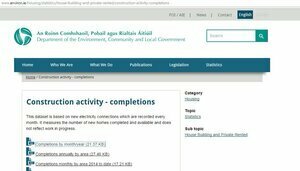 The construction industry in Ireland is effectively at full capacity already. Demand for their services exceeds supply and is driving prices up. I’d prefer the government didn’t stoke the fire further by throwing mountains of public cash at the problem. I have family trying to build a home in the Midlands and the quotes already exceed what the house would be worth when finished. This would only make the problem worse. Government needs to prepare to step in (land banks, funding, etc) when the next downturn hits. I’d love to know who is expected to build all these houses and where are they going to live while they’re being built. Also, how do we slow down the rate of house building before it overheats? We need a recession to reduce demand. Perhaps Brexit will suffice? What dent did the right to buy put in to the social housing stock? Should empty nester residents in 3/4 bed houses not be housed in smaller units? Yes they should. And empty nesters in privately-owned houses should be encouraged to more too.